Hey everyone! It's Tuesday, so that means I'm (jenn) back with another post for you! Here is my last card as a guest designer here at Paper Made Bakery. 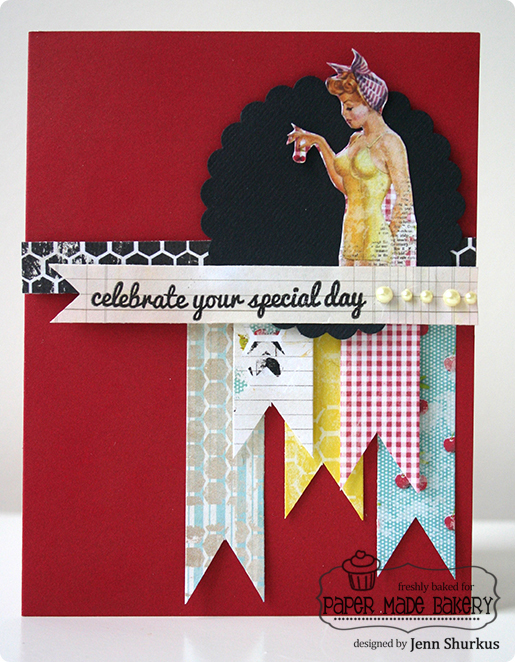 Even though PMB will be no more I am *wicked* excited to see what Shannon will be up to with Fresh Squeezed Stamps! I again used a mix of the papers in the Glitz 6x6 paper pad and the Glitz layering papers. I cut this "scrappy dame" out of one of the papers as well. The fabulous sentiment is part of the Fresh Squeezed stamps that all come in the One Scrappy Dame kit (the pearls and black cardstock are too!). Be sure to purchase your own kit, before they are all gone! Thank you so much Shannon for inviting me to design for you- wishing you luck in your extra time devoted to Fresh Squeezed Stamps! Be sure to visit me on my own site shurkus.com for continued inspiration! This ROCKS!!! LOVING the girl and the pennants!! Love the banners showing off all the fun paper!